As I've said before, one of the supreme delights in my work is being invited to schools and libraries as a visiting author. Back in May, I had the pleasure of presenting two different young writers' workshops to second grade students at Raleigh Park Elementary. During my first round of classroom visits I presented, "Write On!" a workshop about why I write and some of the amazing experiences I've had because I'm an author. During the second round of visits I presented, "Gotcha! How to Find and Capture Great Writing Ideas." One of my favorite parts of school visits is receiving letters and pictures from the students. The image to the right is a sampling of letters that arrived in my mail box soon after my visits. Thank you for taking the time to write and for letting me know what you learned when I visited your school. Pickle and I have read and re-read each of your letters, and we have greatly enjoyed your artwork. I especially liked how many of you included pictures or mention of my chicken hat, my reading trophy, and Pickle the Cat in your notes! Pickle is sitting right next to me as I write to you today. I’m delighted that so many of you are excited about writing and sharing your own stories, and I’m happy that you enjoyed learning some sign language. I hope you continue to read, write, and sign regularly and with enthusiasm! Isabelle: You asked if I have a dog. I do. Her name is Sophie. She is a white Chihuahua. You also asked where I go on vacation. One of my favorite places to go on vacation is Sunriver, in Central Oregon. Lastly, you asked what books I would recommend to an eight year old. What I would recommend is that you visit the West Slope Library and make friends with the youth librarian. Let her know what interests you and she will keep you well-supplied in great ideas for books you will enjoy! Kaya (I may have spelled your name wrong. I’m sorry if I did): You asked if I like reading or writing better. I have to say that I simply cannot choose between the two. I love to read, and I love to write! Zachary: You asked when I learned sign language. I first learned about sign language before I started elementary school. I watched Sesame Street on television and learned about sign language from Linda Bove. When I started elementary school, I volunteered to help students with disabilities, and many of those students used sign language. Dahlia: You asked if Pickle is being good. Pickle rarely behaves, but she is always a good cat (and you are right—she does like to sleep on my soft, cozy, colorful pajama pants). Isaac: You asked how Pickle got her name. From the time Pickle was a kitten she liked to get into mischief. In fact, we almost named her Mischief. When she would do something mischievous (like get on the kitchen table, or try to sneak outside, or hop up on someone’s shoulders), we would say, “You are such a Pickle.” Pretty soon the name stuck. It fits her well. Sophia: You asked what my favorite book was as a child. I had many favorite books as a child. One of them was Charolette’s Web. Gavin: You asked how I met Bruce Hale. Bruce Hale and I both belong to an organization called The Society of Children’s Book Writers andIllustrators. The members of this organization hold educational meetings called a conference (it’s like “school’ for authors and illustrators). I first met Bruce Hale at one of those conferences. Bradlon (I may have spelled your name wrong. I’m sorry if I did): You asked if Pickle gets sick from eating my paper. She has not gotten sick from eating my paper, but sometimes she coughs up very big fur balls. Yuck! You also asked if Pickle is on the floor or on my books right now. Actually, she is on the couch next to my desk, looking out the window at a bird that is teasing her. Walter: You asked how I met the illustrators for my books. I first met Stephanie Bauer (the illustrator for my Story Time with Signs and Rhymes books), at a writing conference (which is similar to how I met Bruce Hale). I’ve been lucky enough to visit her art studio. The first time I met Abigail Marble (the illustrator for First Day Jitters, the story that is in Oregon Reads Aloud) was last year. We were both at Powell’s Books to celebrate the Book Birthday for Oregon Reads Aloud. You can see examples of Abigail Marble’s work on her website: http://abigailmarble.com/. Avery: You asked if Pickle is afraid of cucumbers. I do not know if she is or not. I have seen some videos of people who have scared their own cat with a cucumber, but I don’t think Pickle would appreciate me playing a trick like that on her. You asked if my favorite color was pink. Actually, my favorite color is purple. P.S. Did you know your dad is my son’s teacher and tennis coach? Gwen: You asked if I had any siblings. I do. I have two younger sisters: Angela and Carey. Angela lives in San Diego, California, and Carey lives in Beaverton, Oregon. Pearl: You asked if I am a cat person or a dog person. I like both cats and dogs, but I think of myself as a cat person. You also asked who is my favorite character in my books. I have a lot of favorite characters in my books. One of my favorites is the dog in Silly Sue. She looks and acts a lot like my dog, Sophie. Pearl (Are there two Pearls, or one Pearl with lots of questions? ): You asked how I got Pickle. We have had Pickle since she was a kitten. She and her sister, Noodle, were stray kittens without a mama cat to take care of them. Our family gave them a safe foster home until they got big enough and strong enough to take care of themselves, but then we decided to adopt them and give them a permanent home. That was seven years ago. You also asked if I am from a divorced family. I am. My parents divorced when I was in the 6th grade. I’m sorry you are having some sad feelings about your parents’ divorce. I hope you will write in your journal about your feelings. When I am sad, I always feel better after I share my feelings in my writing journal. Jackson: I’m so glad you are planning to look for my booksin the library. You can ask the librarian to help you find them if you are not able to find them on your own. Alondra: You asked if Pickle is a boy or a girl. Pickle is a girl. You also asked if Pickle likes to roll around on my papers. Pickle likes to roll around on many things, including stacks of paper, my messy desk, and the cool floor in my laundry room. 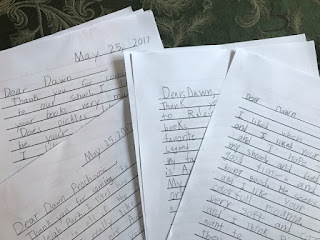 Abby: You asked if my kids help me write. My kids help me critique my stories. I ask them to read my stories out loud so I can listen to any parts that don’t sound just right when they are read out loud (by someone other than myself). You also asked if I write outside. I do. I write just about everywhere! Benjamin: You asked how long it takes to make one book. This is a complicated question, because some stories take a longer time to write than others, and some books take longer to get published than others. I can tell you that I started writing See theColors before my son turned two, and he was seven when it was published. Darvey: You asked what my favorite game is. Right now my favorite game is a card game called Skip Bo, but I like trying out new games. Did you know that the West Slope Library has lots of games that you can borrow, just like you can borrow books? Lev: I like the pictures you drew of Pickle and Rose (you did a nice job illustrating that Pickle has green eyes and Rose has yellow eyes). Alexa: You asked if Pickle has her own bed. She does, but she often sleeps on my pillow (or on my head) in my bed. You also asked if I listen to calm music when I write. I have many writing friends who like to listen to calm music when they write, but I prefer to write when it is quiet. Chase: I’m glad you think books are cool. I think books are cool, too! Dalia: I’m glad you liked my funny pajama pants. I like them, too! Several of you asked how I became an author. I have a detailed answer to that question here: http://www.dawnprochovnic.com/2012/02/my-path-to-publication.html. Thank you again for all of your letters and pictures, and thank you to Mrs. Baumgartner for inviting me to visit. I hope I get to visit your school again in the future. I'd love to visit your school, too! If you'd like more information about author visits, click here, or send me a message using the contact form to the left. Stay tuned. In my next post I will share the second letter I wrote to students I visited at Raleigh Park Elementary in May, 2017.